The week of Half Full will be 5 years since I was diagnosed with thyroid cancer. Soon after being diagnosed with thyroid cancer in Oct 2007, I signed up for my first triathlon that I completed in June 2008 (The Philadelphia Triathlon, Olympic distance). 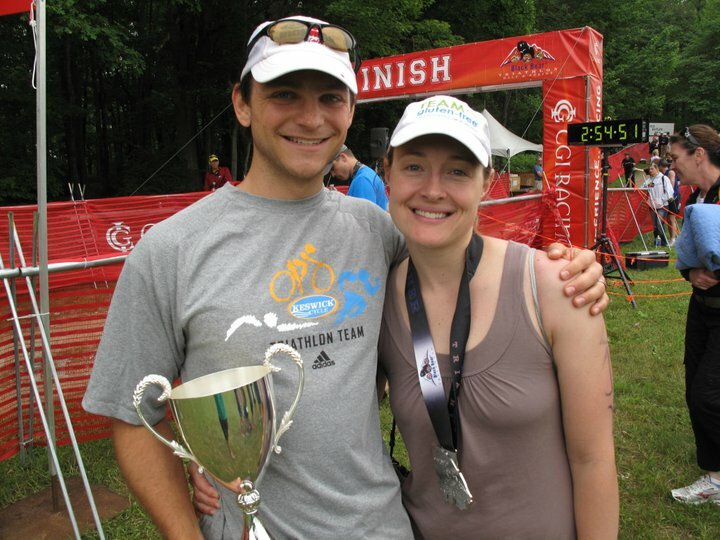 I also joined a local triathlon club where I met my now husband. We married less than a year later in May 2009. Triathlon has become a meaningful part of my life! I am happy to report that I have made a full recovery and am doing well. This race is a celebration for me of what I am physically able to do and what I have overcome. I am happy to be racing the Half Full that benefits the Ulman Cancer Fund, and I am very happy to have my husband cheering me on. This entry was posted in Uncategorized and tagged Deanne Morris, Half Full, Half Full Triathlon, The Ulman Cancer Fund for Young Adults, young adults and cancer, young adults with cancer. Bookmark the permalink.